You’ve come to the right place in finding the best detailed information and recommendations on the best running shoes for forefoot runners. I must underscore that the most ideal structure for a forefoot running shoe should help stimulate the feet directly on multiple fronts (i.e. the shoe should have a paper-thin outsole and an overall flexible infrastructure) AND is zero drop (flat, no raised heel), which collectively, makes your forefoot strike landing more productive in ways that permits enhanced elastic energy storage in the arch and Achilles tendon, helping enrich running economy sustainability. All in all, a typical forefoot running shoe should be very minimalistic (barefoot-feeling), allowing your feet to feel as free as possible with natural-feeling material conditions, including a super-thin outsole that provides a wealth of sensory assistance AND should be lightweight whereby a feather-light minimalist, barefoot-inspired running shoe may improve running performance due to their reduced mass (Divert et al., 2008; Franz et al., 2012). Therefore, the lighter, the better. Makes perfect sense. Whether its the Sockwa X8 (left) or the Vibram KSO EVO (right), both are one of the best choices of a barefoot-like minimalist running shoe for forefoot running because they provide a wealth of sensory input critical to prompting a safe, secure and effective forefoot strike, but also the sensory stimulation directly strengthens the intrinsic foot muscles, which altogether is a win-win in helping you get the results you need in making long-lasting improvements in foot health and forefoot strike running form. Another benefit of minimalist running shoes is that they promote greater plantar flexor activity in the foot, helping aid in a forefoot strike (Warne & Warrington, 2014) and a shorter stride during running (Bonacci et al., 2013). Collectively, this shortens the brake period, resulting in less impact on the knee. One thing most runners love most about minimalist running shoes is that they feel more comfortable than standard running shoes. For example, Fuller et al. 2016 discovered that runners with the best running economy wore minimalist shoes, but also had the highest level of perceived comfort as compared with running in standard running footwear. The reason minimalist shoes work best: they feel natural and move with your foot instead of restricting it. And, the barefoot-feel of most minimalist running shoes helps you feel the ground and guide your forefoot strike, the most comfortable way to run. If you prefer some under-foot cushioning, I would recommend the Altra Escalate. The Escalate are structurally-condusive for forefoot running, giving more horsepower to your stride, but for landing stability and sensory awareness purposes, I wouldn’t recommend any more underfoot cushioning than these! I firmly believe that running shoes can make you, or break you when it comes to maintaining the proper forefoot running technique. This is why it’s vital to choose the proper minimalist running shoe! Below is my minimalist running shoe guide for forefoot runners where I have listed my favorite forefoot running shoes that I feel best closely approximate barefoot running and are most suited to help you maintain optimal forefoot running mechanics and stay injury free. Bikila LS – 4 mm thin rubber outsole packs enough durability for the marathon; very grippy tread that provides lots of traction for wet and icy running surfaces as well as the trails. SeeYa LS – Super thin, barefoot forefoot running shoe for the trails, roads and treadmill. Spyridon LS – Has more cushioning than most Vibram barefoot running shoes; intended for road and trail running and running on wet surfaces. 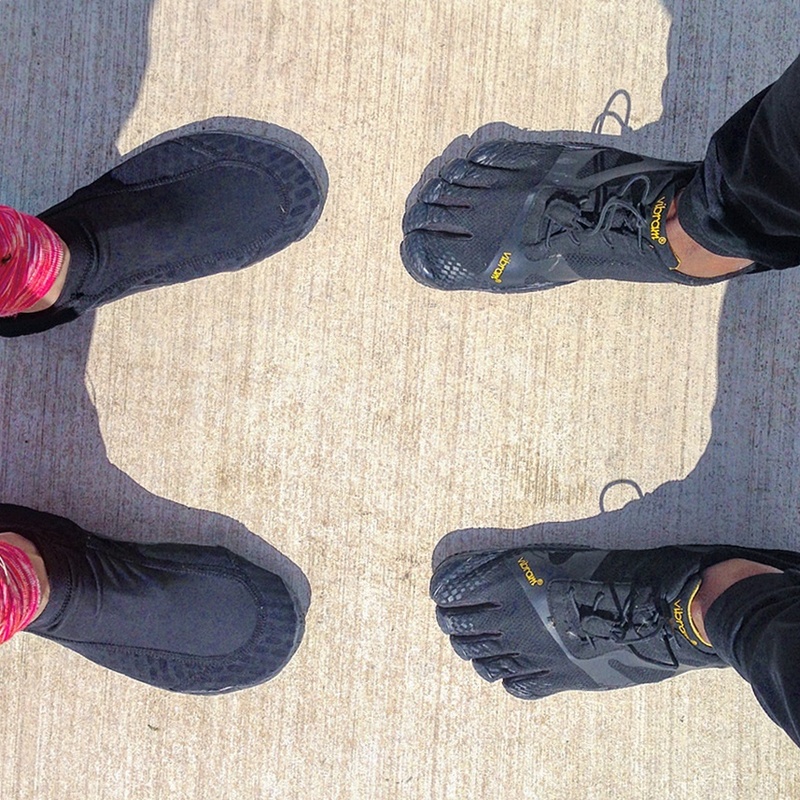 KSO – Most versatile barefoot running shoe from Vibram and was voted the most comfortable, too. KSO EVO – For cooler conditions; intended for both road and trail running. Trek Ascent LR – Made for serious mountainous, rugged trail runs, especially in the winter. KMD EVO – Thicker outsole; made for trail running and also great for mud obstacle races, such as the Spartan Race and Tough Mudder. Bikila EVO – Long distance barefoot running shoe that handles all terrains. Jaya – A leather upper, women’s only barefoot running shoe that is strapless and lace-less and can be worn in the water and winter. KMD Sport LS (KomodoSport LS) – Great for speed-work; running short distances; stitch-free inner makes it super comfy to be worn without socks. V-Run – An upgraded version of the Bikila; great for long distances; has a little more padding in the midfoot; upper is super stretchy. Spyridon MR Elite – Made for serious long distance trail runners, the MR Elite is durable for rocky trails, is great for beach running, the marathon and obstacle course races. The stitching is very durable and the upper is very secure, wraps nicely around your foot, keeping dirt and small pebbles out. Ultra – Extremely lightweight; made for long distance running and water sports. Motus – The Motus has more cushioning than most Vivobarefoot running shoes and Vibram FiveFinger running shoes, but is still a commonsense approach to improve foot health and function because it gives good ground-feel. Its great for running long distances on the roads and grips well when running on grass. Achilles Running Sandal – Barefoot running sandal for wider feet. One M (Men) and L (Ladies) – More minimal than the Merrell Vapor Glove; made for road racing on concrete, gravel, mud and snow; great for mud obstacle course races. Stealth – For running on smoother surfaces, such as the road, track or treadmill. Evo Pure – Wide toe-box, great for road racing any terrain. Stealth 2 WP – Winter proof barefoot running shoe with a 3mm thin, grippy outsole for wet surfaces. Evo Lite – Great for all-weather conditions and any terrain; comes with a light removable insole. Stealth II – One of the more barefoot-feeling shoes by Vivobarefoot; zero drop; good for long distance running on the roads/track; breathes well, great for the summer. Eclipse – If you are looking for a barefoot minimalist running sandal, the Eclipse is a great choice; 5 mm thin outsole that is puncture-resistant and grips well to any terrain; total flexibility –it can be rolled into a ball; great for trail and road running as well as running on wet surfaces. Primus Road – If you like the EVO Pure, you’ll love the Primus Road. It has a 3 mm outsole and is super breathable with its see-through upper mesh, and the shoe is perfectly designed for running on the roads. Nimble Toes – Designed in collaboration with world renowned running technique coach, Lee Saxby, the Nimble Toes are Vivobarefoot on steroids as the Nimble Toes have a more meatier upper and outsole that does a nice job at providing rock protection more fully, while delivering the right amount of ground-feel necessary to uphold a barefoot-like stride on pavement. Like a true minimalist running shoe, the Nimbles Toes are low to the ground, wide in the front, but the most appreciated aspect of the shoe is its robust 4-mm thin Vibram rubber outsole which puts enough rubber in contact with the ground to firmly grip the pavement and guards against any rocks and twigs on you may step on. Escalante – If you love lots of under-foot protection for the roads, than the Altra Escalante is your cushy companion! Despite the under-foot padding thickness, the Escalante’s, somehow, has the similar feel to more barefoot-inspired running shoes! Not to mention, the structure of the Escalante does a nice job at guiding your forefoot strike to where it needs to be! Also, the Escalante’s is the perfect utility for those slowly easing into minimalism and barefooting. One of the softest, most nimble and agile zero drop minimalist shoes I’ve ever had is the TadeEVO. Not only do they look superb as a casual shoe, the TadeEVO is a solid choice for road running of all distances. The dense closed-mesh on the sidewalls of the shoe coupled with the leather velour framing, gives the upper durably sturdy construction that delivers good rock and thermal protection and gives a snug fit throughout. Additionally, the 5-mm thin rubber sole is flexible and bendy thus functional, but is sticky which improves grip on wet slick roads. If you were a big fan of the Skora minimalist running shoes, you’ll love the Lem’s Primal 2! Like the Skora’s, the Primal 2’s have a strikingly similar fit and feel as well as similar construction, such as a wide, flexible toe-box, a firm under-foot feel that impressively reproduces the sensory dimensions of being barefoot, an ultra-lightweight yet durable frame and a low-to-ground 0-drop outsole, which altogether, enhances the natural stride of forefoot running, which in turn, gives you a bigger boost in achieving faster, more easily sustained forward momentum. Ultimately, the net of effect of running in the incredibly well-rated Primal 2s is more positive results performance-wise and in building a functionally stronger, more enduring foot, putting you on a much more secured path going forward. Bare-XF 210 – Zero drop, extremely versatile; great for Tough Mudders and Spartan Races. Bare-XF 260 – Perfect for not only forefoot running, but is commonly used for weight-lifting as well. The Original Luna’s – Super comfortable barefoot running sandal; provides lots of traction with its “monkey grip” Vibram 7 mm rubber outsole; handles running on the roads and moderate trails. Amuri Cloud – Ultra thin barefoot running sandal that is super-easy to strap up! Amuri Z-Trek – an ultra-sport barefoot running sandal without the bothersome toe strap! Amuri Venture – High performance barefoot running sandal that comes already laced (like all sandals from Xero Shoes) and is made for ultra-marathons. Vapor Glove – Great for both road and off-road running; breathable and super lightweight. Trail Glove 3 – Robust trail running shoe tough enough for punishing rocky paths. Tesla has a running shoe that feels very similar to the Merrell Vapor Glove. It also looks just like the Vapor Glove, too. G4 – Another barefoot running shoe alternative to the Vibram FiveFingers and keeps your feet pleasantly warm in the snow. X8 – Another thermal shoe that’ll keep your feet toasty in the winter; thicker outsole, so you don’t feel any gravel on your feel. G Hi – This shoe was made for forefoot running with having one of the thinnest outsoles (2 mm thin) that is incredibly durable for any terrain, so you know exactly where to land on your forefoot when you run. Also, the design of the shoe keeps debris out. The neoprene upper not only keeps your feet dry, but warm, too. This really is a multi-purpose barefoot shoe. GEL-Fortius TR – This is an all-purpose barefoot running shoe; great for cross-training: climbing, dead-lifting; great for the trails. Piranha Sp4 – A minimalist shoe with a little under-foot protection; super lightweight, great for racing and distance and super comfortable. Wave EVO Levitas – Super breathable, tremendously light, durable zero-drop outsole, built for long distance running. Wave Universe 5 – No heel, feather-light, racing flat. Nike Free 1.0 Cross Bionic – This is the only Nike barefoot running shoe that is suitable for forefoot running that is more minimalistic than the Free 3.0s and 5.0s which have been linked to injury in runners. Fit – D-width toe-box, roomy, great for ultra-running. Phase-X – Thick outsole, durable for ultra-marathons, wide toe-box. Form – For long hard runs; wide toe-box; overall shape accommodates the foot’s naturally anatomy. Pearl Izumi does not have a lot of minimalist running shoes, but they do have the EM Road N 0 which is a great forefoot strike strength builder and is great for any run that is short, long and super long. Saucony is another brand that needs to make more minimalist shoes in addition to their Hattori LC, which is a more cushioned version of the Merrell Vapor Glove. For a more cost-effective alternative to the minimalist forefoot running shoes listed above, you can always check out Walmart, Target, athletic stores and Amazon that sell water socks, which are definitely a cheaper way in accessing the sensory input that can give you the mechanical help you need and can renew your capacity to keep your feet strong in a sustainable way. Water socks are just as compatible as most barefoot running shoes, whereby the continuous stream of sensory feedback you get from the thin outsole, automatically activates a wide range of reflexes in the lower leg in ways that help you re-capitalize on better movement efficiency and mechanical effectiveness and should be part of the solution in reviving foot strength and function. 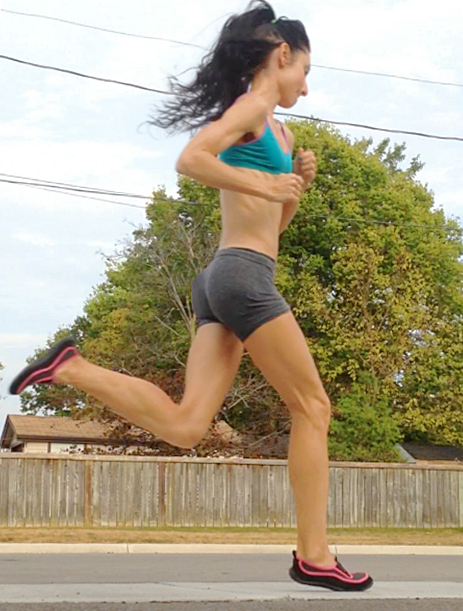 If you’ve enjoyed this post, you’ll also love my YouTube channel: here, where I provide more underlying evidence of the importance of barefoot running in how it can help speed things forward in terms of mechanical improvements and performance gains! You can also follow me on Facebook: here, where you can enjoy good discussions about barefoot running, minimalist running and minimalist running shoe reviews! Divert, C., Mornieux, G., Freychat, P., Baly, L., Mayer, F., & Belli, A. (2008).Barefoot-Shod running differences: Shoe or mass effect? International Journal of Sports Medicine, 29, 512 – 518. doi:10.1055/s-2007-989233. Franz, J. R., Wierzbinski, C. M., & Kram, R. (2012). Metabolic cost of running barefoot versus shod: Is lighter better? Medicine & Science in Sports & Exercise, 44, 1519 – 1525. doi:10.1249/MSS.0b013e3182514a88. Fuller et al. Effects of a minimalist shoe on running economy and 5-km running performance. J Sports Sci, 2016; 34:18, 1740-1745. Thanks for the blog and generous info. I’m wondering if you could narrow your favorite down to 1-3, on the purists/functionality side of things. On the new Balance minimus. What about Lem’s shoes? I got the Primal 2 recently. Thanks! No Altra? I was born a forefoot runner. Short for my height but faster than the taller girls. It wasn’t until I married that my husband pointed out to me that I am wasting energy going up and down so much and that I shouldn’t be running on my “toes” but from heel to toe. 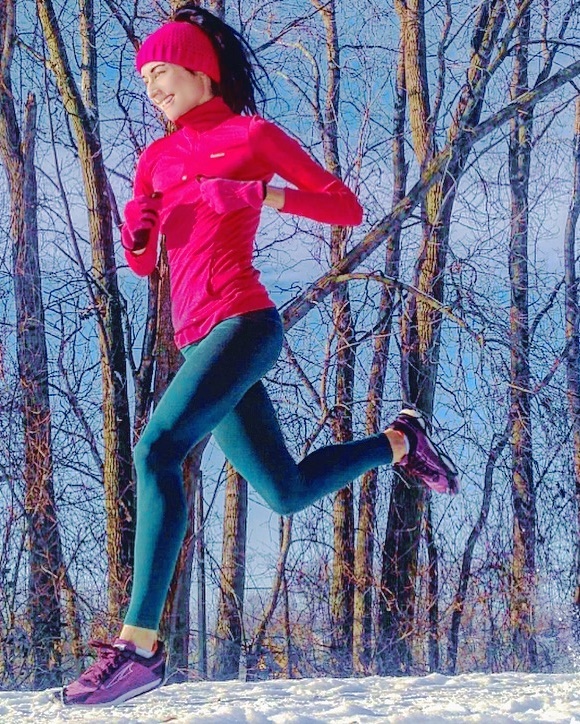 I pushed myself to run heel to toe (awkward for me) then three years later read forefoot running was okay to do and switched back after I had already acclimated to heel toe running. Anyway, much older now and need the cushioning in the forefoot area. So, I just purchased the Altra Escalante and I really like them. Have you tried them? More for people that are forefoot strikers but not barefoot runners perhaps. Have you had any experience with the Topo Athletic ST-2 shoe? Looks wise it seems to be resemble the Altra Escalante, you are wearing above. The St-2 is listed as being a flexible shoe with a close to the ground feel. For now I need a shoe with as much flexibility with some cushion until I can transition out of the brick like, over cushioned, not so flexible shoes, that are doing nothing to help me excel in running. Thank you for all of the great info. I love your website. Will you ever do any reviews on Vivobarefoot shoes? If I’m looking for a running sock should I go for the Skinners or the Sockwas?